Whether it be to buy a home or list a home, my goal is to provide exceptional service. My clients appreciate that I take the time to explain the process every step of the way and stand by them with constant communication as they go through the process. My personality allows me to be able to work smoothly with everyone who will be involved in the transaction. Having a mortgage lending background allows me to understand and be able to explain to my clients the lending process. Buying and selling a house can be one of the most stressful events in your life. My sense of humor will help ease any pain that may arise in the process. I look forward to showing you why my prior clients refer me on a regular basis! My senior year in high school my number one career match was Realtor. At the time, being somewhat of a fashion snob, all I could think of was Century 21 and the gold blazer (I just dated myself). I attended Business College in Salem and landed in the mortgage lending industry. As a loan processor I was in charge of the monthly draws for the construction loans. I found the process of building a house from the ground up fascinating. I truly can appreciate what it takes and what goes into building a house. I have had two homes custom built for myself and was involved every step of the way. I’ve always seen value in home ownership. I bought my first house when I was 23. I received a severance pay from my then relocating employer. Most young adults would have bought a car or gone on a shopping spree. Me, I bought a house. I stayed home to raise my 2 girls and during part of that time I bought several little houses, fixed them up and sold them. This was before there was a term called “flipping”. I love the before and after. I currently work with Dales Remodeling and together we have been giving new life to older neglected houses allowing new owners to enjoy them and make them their home for years to come. While raising my girls I also operated a sewing business from my home. I sewed home décor. For about 15 years I visited many homes and loved helping people turn their house into their home. My sewing work has been featured several times in Salem Home Builders Association Tour of Homes and The Statesman Journal. I have always loved houses and find myself while watching a movie paying more attention to the background of the movie, admiring the decor of the house, than to the movie. 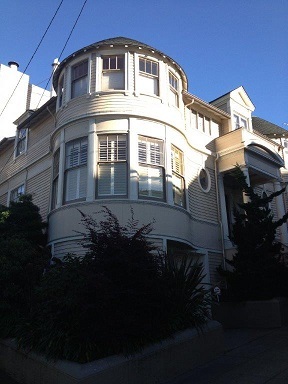 My favorite movie house is Mrs. Doubtfire. 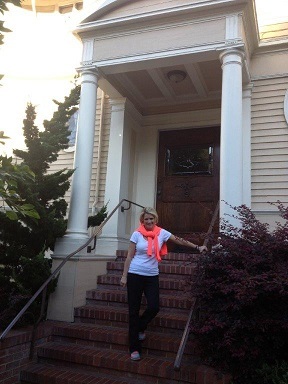 On a recent trip to San Francisco I actually found the house where the movie was filmed! What a thrill for me! Whether you are buying or selling I can help fulfill your needs. Because I work together with Dales Remodeling, if your home is in need of some repairs or updating in order to get it ready for market, or if you find a home to buy that needs repairs or updating, I can help. I have lived in Salem almost 30 years. I’m happy to be finally doing what I was meant to do- sell real estate. I am extremely hard working, organized and honest. I have a true passion for selling real estate. In my first year in the business I closed 15 transactions, all while also holding down a full time job with the State of OR!